Binary division calculator - an online tool to perform division between 2 binary numbers. The logic & solved example may useful to understand how to perform such arithmetic operation. 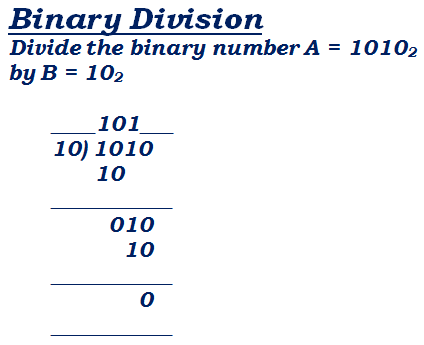 Binary division is one of the most basic & important arithmetic operations in digital electronics & communications. The below logic or truth table is used in this binary division calculator to perform the division between two binary numbers. The below solved example may used to understand how perform the division between 2 binary numbers. Divide the binary number A = 10102 by B = 102 & find the quotient. In digital electronics & communications, the arithmetic operation between binary number systems play vital role to perform various operations. The above truth table & solved example for binary division may useful to understand how to perform such calculations, however, when it comes to online, this binary division calculator may useful to perform such computations as easy & quick as possible.